Rumble Racing mini-game from Kingdom Hearts Birth by Sleep. 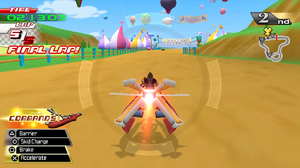 Rumble Racing is a mini-game in Kingdom Hearts Birth by Sleep which can be played at Disney Town or Mirage Arena. It consists of a race through Disney Town on your Keyblade Glider, and includes shortcuts, speed boosts, ramps, and attacks from other racers. After receiving a Disney Town Passport from Ventus, Terra stops by at Disney Town. Just then, he sees a group of Unversed on the racing course of "Rumble Racing". He attempts to pursue them only to nearly be run over by Pete in his vehicle, posing as "Captain Dark". Luckily, Queen Minnie alerts Terra just in time for him to avoid it. After being scolded by Chip and Dale for running onto the racetrack, which is against the rules, Terra explains that when fighting Unversed, you have to break the rules. Chip and Dale angrily compare him to Pete, after which he appears in the guise of Captain Dark. Pete talks to Terra and runs away to prepare for his next race. After Chip and Dale explain to Terra that Pete always breaks the rules while racing and needs to be stopped, they suggest to him to participate in the race as a means to defeat the Unversed and stop Pete without breaking the rules. Participating in the race allows Terra to discover that he may not need to give in to the darkness in order to achieve his goals, and that following the rules may give him the same reward. He also receives votes from Chip and Dale for the Million Dreams Award. To succeed in Rumble Racing, the main focus should be to go through a maximum amount of booster rings, while avoiding as many tornadoes as possible. Courses also contain shortcuts only accessible via booster rings. When starting the race, push right the moment "Go" appears on the screen at the beginning of the race. Doing so will grant a speed boost. When "Locked On" or "Danger" is at the bottom of your screen, press to defend. Throughout each course, there are shields that can be picked up to protect the player from tornadoes and other racers. As an added bonus, the shields hurt other racers on contact, acting like a regular attack. While playing as Terra or Ventus, locking onto another racer and attacking successfully gains a temporary speed boost. Aqua doesn't have this same speed boost but she has a longer ranged attack to compensate. The appearance of Keyblade Gliders changes when used in Rumble Racing. ↑ Only available at first place.